﻿ How to Use Pinterest to Boost Holiday Sales » Red Mango Marketing! Is Pinterest part of your holiday marketing plan? If you’re not using Pinterest to promote your business during the holiday season, you’re missing out on potential sales. According to data released by Pinterest, 55 percent of people on Pinterest use it to find or shop for products. With 82 million searches for gifts on Pinterest and pinners spending twice as much as the general public, it’s time for you to make Pinterest a priority. Everyone has a hard-to-buy-for person on their gift list. Shoppers often turn online to find inspiration for that perfect gift. In fact, 69 percent of people research purchases online before visiting a store. Use Pinterest to your advantage to provide resources for holiday shoppers, like The Crafty Yankee. They created gift guide boards on their Pinterest account, and last year, the shop participated in group boards with a small business association, another local business, and a local blogger to create gift guides with pins of their products. Taza Chocolate’s “Holiday Favorites” Pinterest board is a great resource for customers to see their products in action. 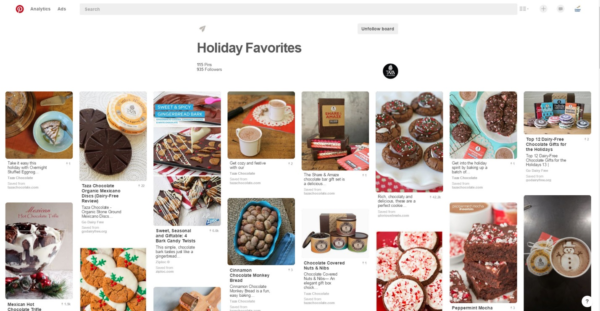 They’ve pinned products, recipes, and reviews to show off the endless number of holiday treats their customers can create with their chocolate. 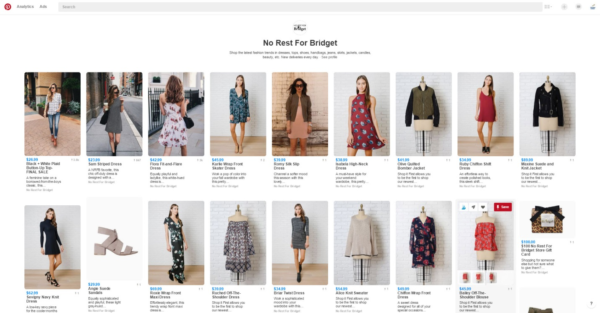 Pinterest’s Product Pins and Buyable Pins make it easier for potential customers to get all of the information they need on your products — like pricing and availability — and they can easily click and purchase from a pin. What’s the difference between Product Pins and Buyable Pin? Product Pins: To activate Product Pins, you need to add some code to your website that will pull in pricing, descriptions, and other information about your products when anyone creates pins from your website. The pins are linked to your site, and pinners can click the image of the pin or the Visit button on the pin to go to your website and buy from you. Buyable Pins: Buyable Pins are newer and allow people to shop on Pinterest without leaving the social network. They’re not yet available to everyone, but you can apply to get Buyable Pins through Pinterest. If you are approved, pins that link back to your website will include a Buy It button that enables pinners to buy from you while they’re using Pinterest. Your Pinterest account will also have a “Pins you can shop” board to make it easy for users to find your Buyable Pins. Clothing store No Rest For Bridget has enabled Buyable Pins on their Pinterest account. Clicking on their “Pins You Can Shop” board takes you to their latest products that are all labeled with the current price. If you’re thinking of adding Pinterest to your holiday marketing, don’t wait. 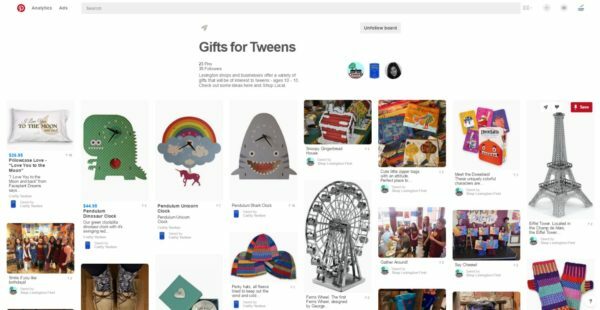 Start pinning now so your products are pinned and searchable by Pinterest users as they make their holiday plans. Drive interest to your new Pinterest presence by linking to your boards on your other active social channels, as well as your upcoming email newsletters. Find out more about how Pinterest impacts the seasonal shopping experience in Pinterest’s new infographic below. You can find Pinterest marketing tips all year round on our Pinterest 101 page. 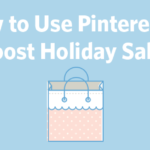 The post How to Use Pinterest to Boost Holiday Sales appeared first on Constant Contact Blogs. This entry was posted on Wednesday, October 19th, 2016 at 10:15 am	and is filed under News & Updates, Pinterest, Social Media Marketing. You can follow any responses to this entry through the RSS 2.0 feed. Both comments and pings are currently closed.